Tickets administered for traffic violations, also known as municipal fines, are monetary penalties. Monetary penalties are penalties that specifically target a guilty party’s income. The greater the portion of income the guilty party loses, the greater the punishment. Of course, when everyone’s monetary penalty is the same, as is the case with municipal fines (the penalty for a 1-point ticket is $70 in every case), some will lose a greater portion of income than others.1 This means municipal fines are in fact fundamentally unjust. Imagine you’ve been charged with speeding 5-9 mph over the speed limit. The fee for this violation is originally $70 (the lowest-level fine for a traffic infraction).2 Once the court surcharge ($20) and court costs ($10) are added, the total amount of your penalty comes to $100.3 Also imagine that you make an annual income of $15,100 (this is $25 over the qualification for indigence for a household with 1 individual).4 A $15,100 annual income provides you with just barely enough to pay for rent, utilities, and groceries each month.5 By the time you’re done paying off all your monthly bills, you’re lucky to have any money left to spare, let alone the $100 needed to pay your fine. Your only option, then, is to wait until your next paycheck and hope you can tighten your budget enough at that point. Based on your annual income, your next bi-weekly paycheck will provide you with $580.6 At $580, a $100 penalty is going to cost you 17.2%, or 1/6th of your paycheck. The portion of your income a $100 fine costs you is very high in comparison to the portion of income a $100 fine costs those who make $100,000/year.7 Someone making $100,000/year takes home a $3,845 bi-weekly paycheck. This means a $100 fine will cost them only 2.6%, or 1/38th of their bi-weekly paycheck. Now, there are two possible options for fixing this injustice. The first would mandate no one would pay a lower percentage of income than anyone else. Then, instead of only a few paying a fine equal to 17.2% of their income, every violator would pay a fine equal to 17.2% of their income for a 1-point violation. In the case of those making $100,000/year, what was a $100 fine would turn into a $662 fine. This chart shows how much a fine of 2.6% and a fine of 17.2% of biweekly income would cost violators in each annual income bracket from $0-$100,000. The second would mandate no one pay a higher percentage of income than anyone else. Then, instead of only a few paying a fine equal to 2.6% of their income, every violator would pay a fine equal to 2.6% of their income for a 1-point violation. This would mean that instead of paying a $100 fine, those making $15,100/year would end up with a $15.10 fine. While $100 is the lowest fine for a traffic infraction, consider that the maximum fine (accounting for the added $20 court surcharge and $10 court costs) is $530.8 For someone making $15,100/year, a $530 fine comes out to 91.4% of their bi-weekly paycheck. While for someone making $100,000/year, a $530 fine comes out to 13.8%. If someone making $15,100/year paid 13.8% of their bi-weekly paycheck, their fine would come out to $80. On the other hand, if someone making $100,000/year were to pay 91.4% of their bi-weekly income their fine would come out to $3,510. 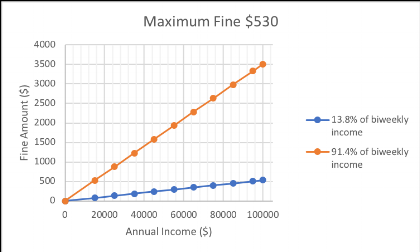 This chart shows how much a fine of 13.8% and a fine of 91.4% of biweekly income would cost violators in each annual income bracket from $0-$100,000. Every violator should find their penalty punishing, but not excessively punishing. And every violator should find their penalty for committing a traffic violation completely reasonable and fair. This is particularly important due to the fact that most Americans’ first experience with the judicial system is probably going to come through municipal court. Therefore, municipal court acts as the primary example of the country’s justice system for the majority of Americans. If citizens feel the justice system is unfair, that it’s rigged in favor of the rich even at the lowest levels, it becomes virtually impossible to convince these same citizens that the justice system isn’t just naturally systemically unfair, unequal and rigged against them at all levels. 4 To qualify for indigence, a defendant at Greeley Municipal Court must have an income equal to or less than 125% of the federal government’s Poverty Guidelines. For a household of 1 individual, that total comes out to $15,075. Retrieved from https://www.federalregister.gov/documents/2017/01/31/2017-02076/annual-update-of-the-hhs-poverty-guidelines. 5 $15,100 is the income used here for the fact that it’s the lowest level of income that doesn’t qualify for indigence. 6 The math used to come up with bi-weekly income was done by taking annual income and dividing it by 52 (the number of weeks in a year). This provided weekly income. Bi-weekly income was then found by multiplying by 2. Note: you get the same fine amounts if doing the math by annual income rather than by bi-weekly income. 7 According to 2016 Census data, a significant number of Greeley residents earn between $100,000-$149,999/year. A total of 13.5% of Greeley residents earn between $100,000-$149,999/year, and an additional 11% earn $150,000 or more per year (5.4% earn between $150,000-$199,99/year and 5.7% earn $200,000 or more per yer). This 24.50% of Greeley residents who earn more than $100,000/year is comparable to 22.2% of Greeley residents who earn less than $24,999/year (10.2% of Greeley residents earn between $15,000-$24,999/year, and 12% earn $14,999 or less per year.) Retrieved from https://factfinder.census.gov/faces/tableservices/jsf/pages/productview.xhtml?pid=ACS_16_5YR_S1901&prodType=table.